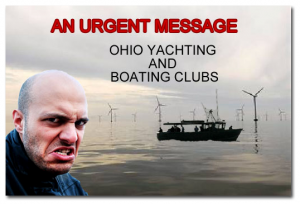 Please see the media release concerning the Ohio Power Siting Board’s meeting in Cleveland, OH, to review public comments on the Icebreaker, Windpower INC., proposal for six massive turbines offshore. 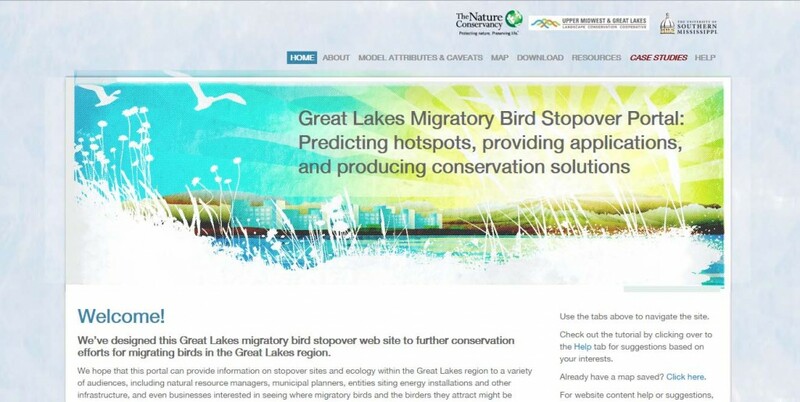 These would, if the developer’s wish list comes to fruition, be the prototype for well over a thousand more, up to 1,400, or more, in Lake Erie, a veritable pincushion of obstacles for bird and bat migration. 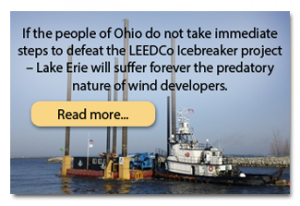 The proponents for a six-turbine array offshore of Cleveland, formerly known as LEEDCo (Lake Erie Energy Development Corp.), Icebreaker, now called “Icebreaker Windpower Inc.,” are attempting to stack the deck in their own favor. While accepting Intervenor Status from those in favor of their industrial offshore proposal in 20% of the world’s remaining fresh water, Sierra, Ohio Environmental Council, Indiana/Kentucky/Ohio Regional Council of Carpenters (the “Carpenters), and the Offshore Wind Business Network, the project’s team ignobly attempt to subvert democratic discussion, and apply to DENY the Intervenor application by Cuyahoga residents Vicci Weeks, and Caryn Good Seward and Steven Seward. The lawyer representing the would-be Intervenors, Mr. John Stock, points out in his reply to the application to refuse, this is a blatant attempt “to quash any voice of opposition, and is “antithetical to the cornerstone of American Jurisprudence…..” Mr. Stock emphasizes the “manipulation” of the system, and possible “ramifications across the country,” if this attempt to quash were to be approved. It is fairly clear again says Mr. Stock in his application, that the OPSB (Ohio Power Siting Board) suspended the Procedural Schedule, based on objections raised by his clients, Weeks and Stewards, regarding the numerous “defects” in bird and bat studies and mitigations of the applicant’s petition. Mr. Stock also references details from a survey in the Plain Dealer, where 57.87 percent of those surveyed disapproved of the Icebreaker project, and many more with no opinion, despite Icebreaker’s contention that 400 public meetings showed approval. As some have now pointed out, holding a meeting does not confirm approval, and may in fact demonstrate the opposite. Holding so many meetings, with inconclusive results for approval, and some inconsistencies in gathering of support with the Power Pledge, may indicate the difficulties that the developer is having to garner public interest and support. The loss of the comments of objection under the former Case number for the project (Case No. 13-2033-EL-BG), renaming, and attaching a new Case number (Icebreaker 16-1871-EL-BGN) to the same project, with a new foreign colleague, Fred Olsen Renewables, also appear to be cause for concern. Lange points out that the in-depth concerns noted by the former Chair, Mr. Snitchler, have not resulted in appropriate study and surveys. The concerns and problems linger, have not been investigated or managed by the developer, and have as much impact on the project’s viability now, as then. The attempt to short cut due process and genuine concerns, some of which would take up to five or more years to fulfil, appears to be in play now, while the developer musters additional troops, and enlists an international Big Wind Player, Fred Olsen Renewables. In 2014, Mr. Todd Snitchler, wrote that the application could not proceed at that time, and provided a laundry list of prohibitive omissions, errors, contradictions, and “minimal analyses.” Much of that critique centered around the need for more in-depth study of bird and bat populations, mortality, pre-and post construction studies of various kinds, as well as more study to be implemented regarding impacted residents along shores, impacts of ice throw, and impacts to the boating communities. And, creating local jobs and spurring economic development. None of these objectives can or will be met with this “icebreaker” project. As it has been stated repeatedly around the world, wind “energy” is merely minimally additive to the energy mix, and will never stand alone, while the need for conventional back up to support the intermittent source will necessarily generate more greenhouse gas emissions from the ramping effect, than running alone at a steady rate. 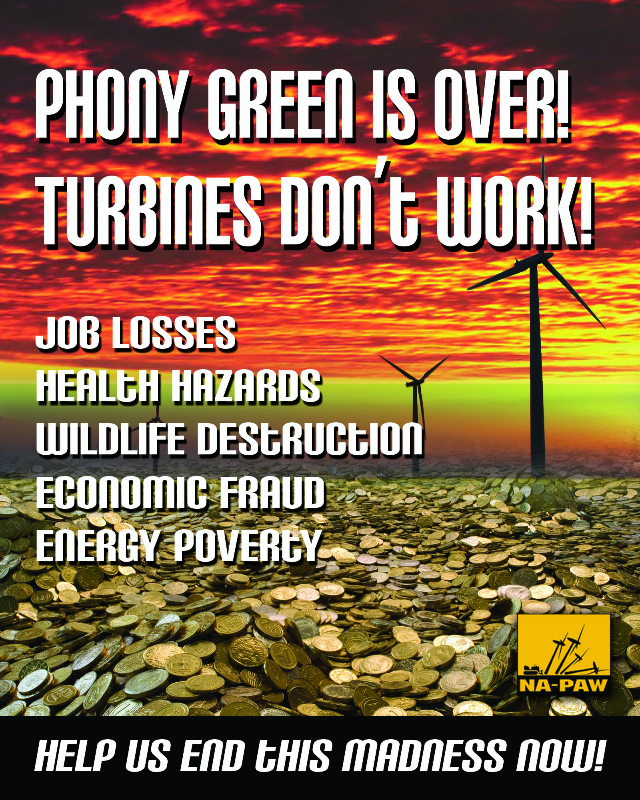 Further, it is hideous to think that these six turbines operating at a fraction of the time, will either serve the needs of consumers, or do anything whatsoever to mitigate fluctuations in climate. The project supports untenable, unreasonable and illogical premises, and needs to be aborted before more tax dollars are wasted. If the OPSB reflects accurately on the comments and submissions, we believe that the result will be another laundry list of requirements, perhaps this time, terminal for a misguided, massively expensive, useless, “demonstration” idea.